– Hostess Donuts; Cook’s Ham Steak. To see the weekly circular for your favorite Fine Fare store, search by ZIP Code or city, state. Walmart Circular April 14 – April 20, 2019. Happy Easter! Kroger Weekly Ad April 17 – April 23, 2019. Happy Easter! 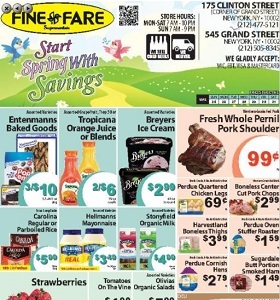 Save Mart Weekly Ad April 17 – April 23, 2019. Easter Savings! Western Beef Weekly Ad April 18 – April 24, 2019. Happy Easter! Cardenas Weekly Circular April 17 – April 23, 2019. Strawberries Clamshell on Sale! I am trying to find my local FineFare Supermarket in zip code 10035. There’s one on 1st Ave between 119 St and 120 St.